Handmade wood Tai Chi Balls (pair). This set of two 4" balls fit in the palms of your hands. 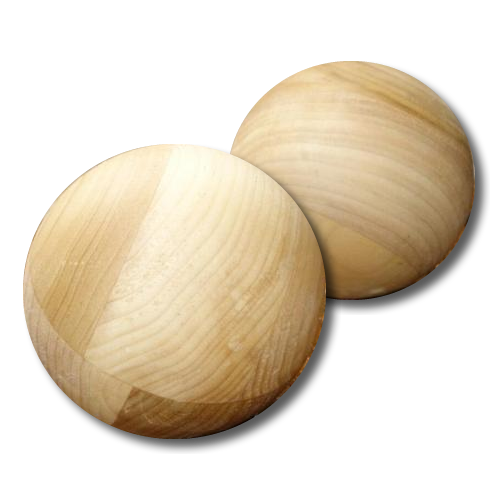 Starter Balls are handmade of poplar wood in the USA, and finished with a natural wax. These Starter Balls are used in the Tai Chi Ball Workout for Beginners DVD. Using these tai chi balls along with the Tai Chi Ball Workout for Beginners program by David-Dorian Ross, you will begin to see fast and long lasting improvements in strength and endurance. Simple activities like doing laundry, removing cartons from the refrigerator, cleaning and vacuuming, and so many other daily tasks should become easier to do because you have strengthened your whole body in a gentle, fun, and very effective way. Tai Chi Ball practice is truly amazing.